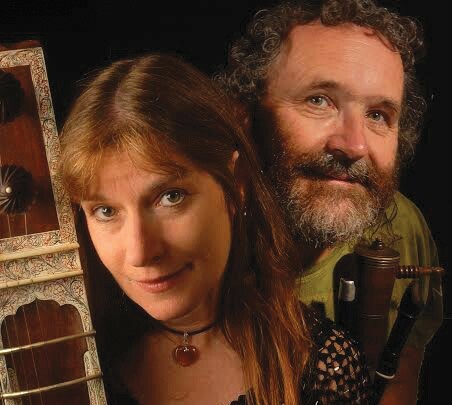 This week, neo-Celtic folk duo Four Shillings Short come to the North Bay for a series of educational concerts titled "Around the World in 30 Instruments." Look for them to do exactly that, as they pick banjos, mandolins, sitars and more along their musical trek. At the heart of Four Shillings Short, which has become a musical institution in the South Bay Area since 1985, is Irish-born, multi-instrumentalist Aodh Og O'Tuama. Anchoring a rotating group of Northern California's foremost Celtic and world-music players, O'Tuama has lived the minstrel life, performing his eclectic array of folk around the country and around the world. And since the late 1990s, he's done it with his wife, musician Christy Martin, by his side. Martin is a native Californian, and her previous folk band, Your Mother Should Know, showed off her abilities at exotic instruments. Now, as a permanent part of Four Shillings Short, she joins O'Tuama in exploring the music of India, Ireland, Scotland, Medieval and Renaissance Europe, and America's blues and folk. The pair will also offer captivating storytelling, dazzling vocal harmonies and family-friendly humor when they perform this week.